Cantos de Navidad is a new album of original Christmas songs written in Spanish and performed in traditional Mexican folk style with voice, guitar and guitarrón. 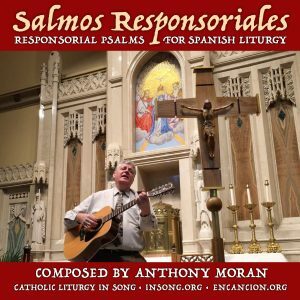 They are composed by Anthony Moran. Tracks 1-15 are performed by Grupo Hermanos de Fé (a band in Mexico). Tracks 16-18 are performed by Tara Moran and Richard Schletty. These songs are easy to sing and play. Free downloads of audio files and guitar lead sheets (complete with lyrics and chords) are available here. New songs are being added to this album each day – from Christmas Day through the Epiphany. Keep checking back. There will be a total of 18 songs in this album – all free for you to enjoy and learn. From the album "Cantos de Navidad"
que por nosotros nació en un portal. Himnos cantamos de amor celestial. en los campos al pastor.